Two posts in one day, go me! 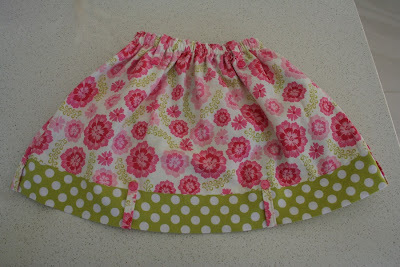 Here's my latest little project, the Flipsy Skirt from Make it Perfect. It's another reversible project and as usual I spent waaay too long trying to decide which fabrics to use. In the end I decided to use up the rest of my Sandi Henderson Medallion Bloom in pink (gosh I'm boring) along with a print called High Tea from Michael Miller. The tea print was an impulse purchase from the fabulous Hawthorne Threads and I was really pleased when it arrived in the post as I liked it much better in real life than on the web. It really suits my little girl who is always hosting little tea parties and offering everyone a 'cup of teeeeeaaaaa!'. The third fabric I used was a green polka dot from Michael Miller that coordinated pretty well with the other two fabrics. The skirt itself was very quick and easy to sew, although I didn't have much patience for sewing and then attaching the belt loops (10 in total). They were so narrow that the feed on my machine had trouble picking them up, and then attaching them with the tiny buttons (I used translucent pink) was tedious. Speaking of belt loops, you'll notice that the belt is nowhere to be seen. I haven't actually made it yet - no excuse other than laziness! It's the same green dot fabric and I have promised myself I'll get it done this weekend! ...this side! High Tea by Michael Miller house designer. And the second side. She told me she was 'so cute' in this one, as only a two year old can. 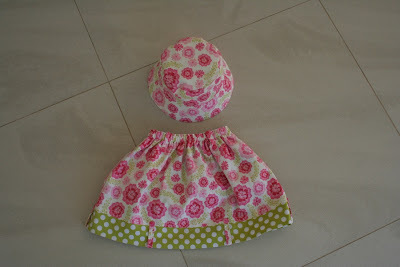 The skirt with the hat I made last month. Just wish I had the foresight to use the high tea fabric for the reverse of the hat. Awww.. it's gorgeous! 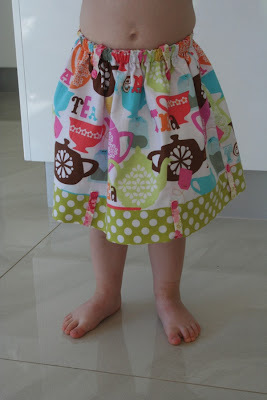 I love the fabrics too, and they look so nicely made! Well done! 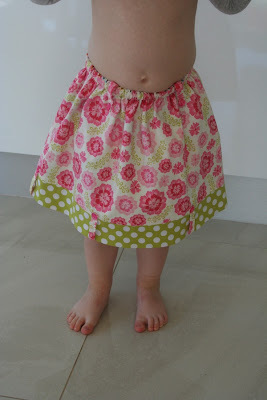 I love the flipsy pattern, its' so versatile and really two skirts in one, just gorgeous! Hope your going to doing some nice applique tops to complete the skirts (and little denim jackets go beautifully with them as well!) *sighs* perhaps I should be making one for Jaida for this season (I loved last seasons one so much.) .. Well done! 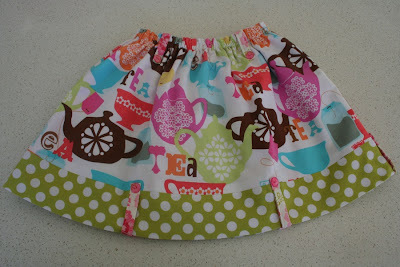 Love that tea pot fabric! Sooooooo cute!